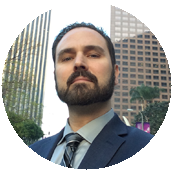 A Recap Of The Nevada Court Reporting Firm Examination | Todd Olivas & Associates v3.0 | Court Reporting Services in Orange County, Riverside, San Bernardino, San Diego, Los Angeles, Irvine, Santa Ana, San Jose, Sacramento, Fresno, San Francisco, Bakersfield. TO&A employs no court reporters, interpreters or videographers of our own. The providers we send are fully qualified and reliable independent contractors. What I great day I had yesterday (photos posted below). 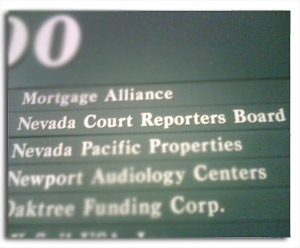 I took the Nevada Court Reporting Firm Examination administered within the offices of the State of Nevada Certified Court Reporters Board. I feel very positive about my chances of having passed the test despite some minor annoyances that I will get into in a moment. 12:30 p.m. - Get sidetracked on the wrong freeway, end up heading towards Reno accidentally... Reno Whoooo! Overall, I feel that the Exam was fair and tested what it should have tested. The study materials referenced by the Board (http://crptr.state.nv.us/forms/FirmForms/Firm_Examination_Guidelines.pdf) were an accurate guide as to the content of the exam. 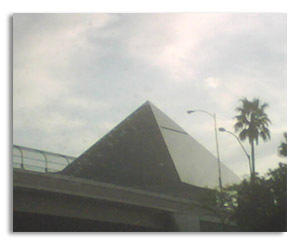 As I posted earlier on my blog Nevada Court Reporting Firm Exam, the Nevada Revised Statues, Codes, Civil Procedures, Opinions, et cetera, were all relevant. My test-taking experience definitely benefited from my time spent studying those sources. Mostly, of course, I hope my test-passing experience benefits as well. The results take approximately seven days, so I'm pleased that the wait is not too bad. Just Say No To Notary? However, one of the references listed -- The State of Nevada Notary Handbook -- purportedly available for sale for $35.00, was never available to me. 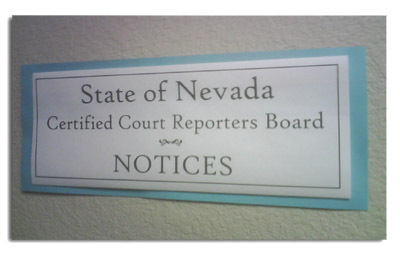 Further, Debbie Uehara told me yesterday that court reporters in Nevada no longer need to be notaries. While I was relieved to hear that, I wish their website could have been more up-to-date and saved me the trouble of studying something that wasn't going to be on the test. However, despite Debbie's information, there was indeed a question about notaries on the exam. Hopefully, I chose the correct answer. Still, I wish there was more congruity on this particular topic. Double Negatives Make A Positive? When such and such situation is NOT the case, what should the court reporter NOT do? When such and such situation IS the case, what should the court reporter DO? Fortunately, not all of the exam items were constructed so poorly. To fix a question with that kind of problem wouldn't take someone too long, I think. Just rephrase it in the positive. In conclusion, I think the test was fair overall and I can't wait for my results. Wish me luck, Everyone! 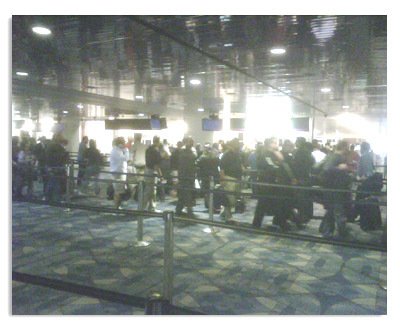 Long lines in Vegas airport! 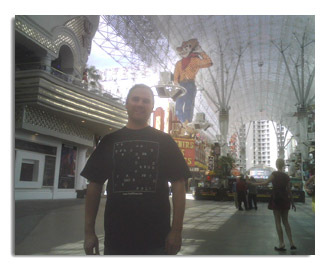 And finally, what trip to Las Vegas is complete without a photo under the Cowboy sign on Freemont Street? Notice my Steno T-shirt? Buy one!